Over the year’s dirt and grime can build up in the crevices of your kitchen, bathrooms and walkway floors. Grout is a porous material so, it easily collects foot traffic, organics and spills which, cause discoloring over time. Regular mopping and spot cleaning cannot reach the deeply seated dirt collecting within the pores of your grout lines. 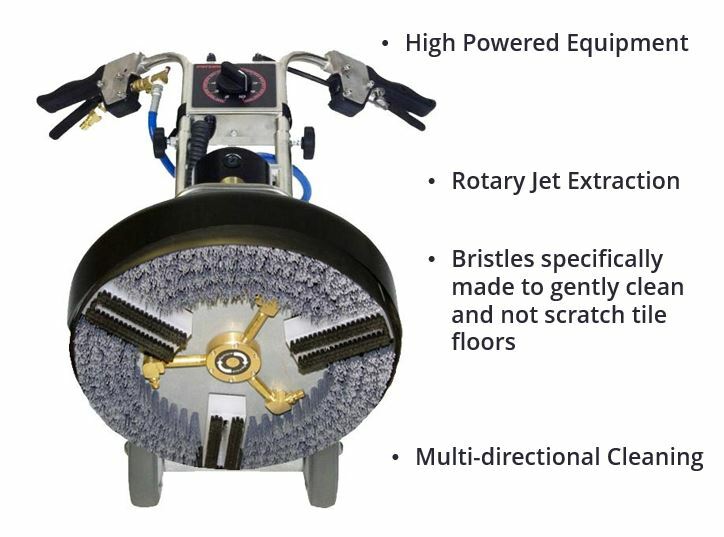 We use high powered "Rotary Jet Extraction" heads that thoroughly clean your floors from all directions with hundreds of cleaning passes. Once the floors have been thoroughly cleaned. You have the option to seal and protect the grout lines. This is only available at the time of cleaning only. We recommend waiting 2 hours before walking on the floor so, the sealant can dry properly. It takes 24 hours to fully cure. Avoid any liquid from coming in contact with the sealant during that time.